Blade length : 62.4 cm or 24.56 inches. Sori :1.2cm or 0.47 inches. Width at the hamachi : 3.0cm or 1.18 inches. 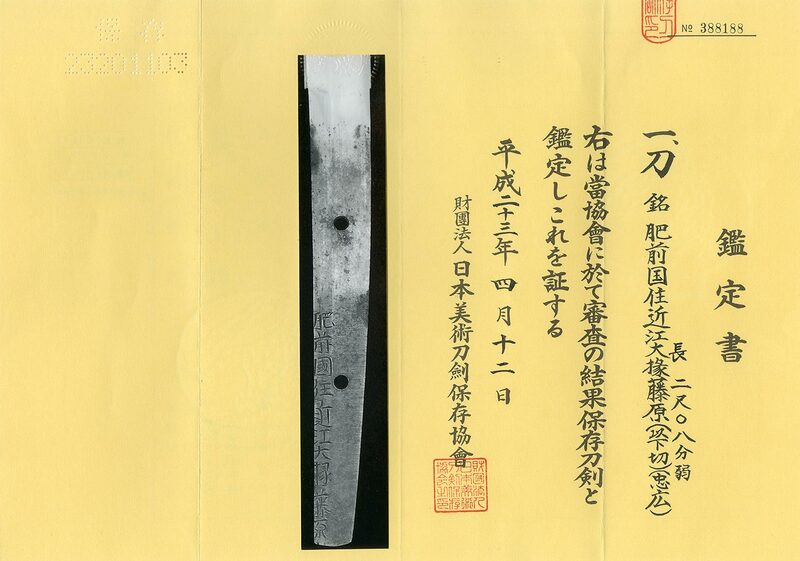 Width at the Kissaki : 2.2 cm or 0.86 inches. Kasane : 0.65cm or 0.25 inches. Shape : The blade is about 8cm suriage mumei. with jinie attach and utsuri appear hizen Konuka hada. Hamon :nie deck middle suguha bright and clear. Special feature:Tadahiro the Second forged this katana. but also supervised many pupils until his death in 1693, aged 80.
as the best among the hizen-to. His swords are ranked at the Owaza-mono because of the sharpness. Tsuba :On the round shape iron stub, a dragon is engraved and nunome zogan. Jyakushi stuba. Menuki :On the syakudo plate, some design is engraved with gold color. 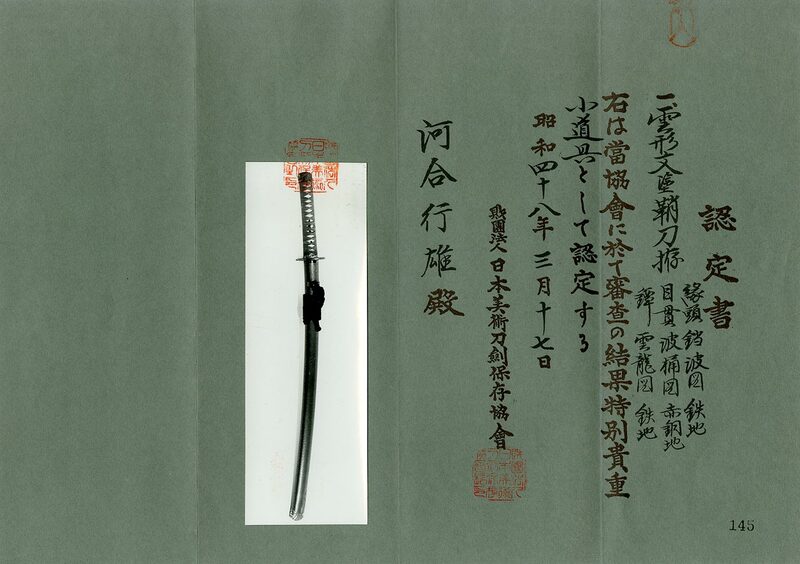 From Aoi Art:This sword is about 8cm suruage and machiokuri bright and clear. which looks like Koto Enjyu. We recommend this nice sword for you. Koshirae is also nice and good condition. Back ground of age: Edo period Kanei era. Aoi Art estimation paper :NBTHK Hozon paper for the blade.